PackageManagement\Register-PackageSource : The repository could not be registered because there exists a registered repository with Name 'PSGallery' and SourceLocation 'https://www.powershellgallery.com/'. To register another repo sitory with Name 'temp', please unregister the existing repository using the Unregister-PSRepository cmdlet. PowerShellGet requires NuGet provider version '2.8.5.201' or newer to interact with NuGet-based repositories. The NuGet provider must be available in 'C:\Program Files\PackageManagement\ProviderAssemblies' or 'C:\Users\Damir\AppData\Local\PackageManagement\ProviderAssemblies'. You can also install the NuGet provider by running 'Install-PackageProvider -Name NuGet -MinimumVersion 2.8.5.201 -Force'. Do you want PowerShellGet to install and import the NuGet provider now? Approving the installation of the updated NuGet provider, resolved the issue. The original Azure PowerShell installation script now worked without errors. The command will open a dialog for you to login into Azure with your account. Now all the other commands will work as well. 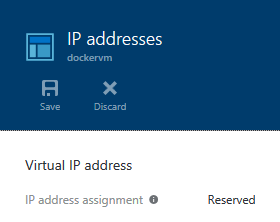 New-AzureReservedIP -ReservedIPName "name" -Location "location" -ServiceName "vm"
name is a name for the Reserved IP address that will help you identify it in the Azure Portal. Although you can't create a reservation in the portal, you can see it and delete it there. vm is the DNS name of your VM without the cloudapp.net part, as you can see it listed in the portal. The command will run for some time. Once it completes, you can confirm in the portal that it ran successfully. In the IP addresses settings for your VM, you will see the IP address assignment as Reserved. Notice, that the reserved IP will not be deleted automatically when you delete the virtual machine. Also, while the first 5 reserved IP addresses are free, you will still be charged for them if they are not in use. Therefore, don't forget to delete the reserved IP address, after you delete the VM you reserved it for.